View along the Lubbock Lake trail system. The Lubbock Lake National Historic Landmark is an important, active archaeological excavation site and a nature preserve. It sits on 335 acres, and is a protected state and federal landmark. It is a unit of Texas Tech and is located just minutes away from the main campus. Dr. Eileen Johnson states, “Lubbock Lake is a National Historic Landmark because of its interrelated records (geology, stratigraphy, buried soils, hydrology, paleoecology and archaeology) that detail the cultural and natural history” (“Lubbock Lake Landmark”, Lubbock Lifestyles magazine, Spring 2017). The landmark was also named one of the top five places to see evidence of the first Americans by Smithsonian magazine in 2014. Next to the parking lot, several large bronze sculptures welcome the visitor: elephants, bison, bear and armadillos, guardians of the nature preserve. 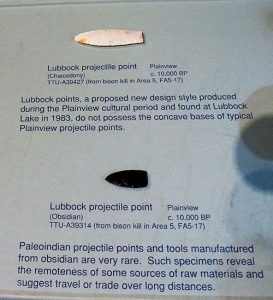 Various types of projectile stone points from different eras were found at Lubbock Lake. 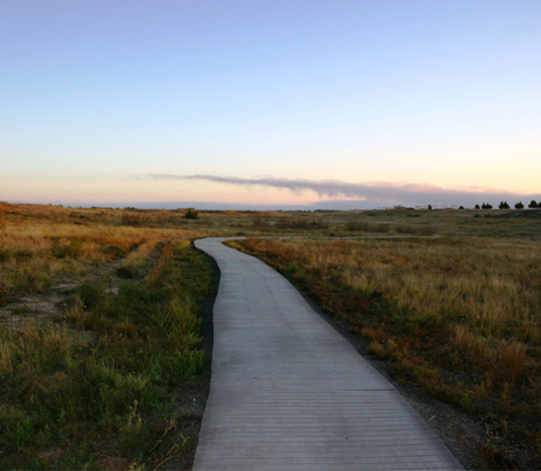 There are three trails totaling 4.5 miles that take the visitor through the shortgrass plains habitat, where scientists have documented more than 130 plant species and almost 140 bird species, as well as the threatened Texas horned lizard and the bobwhite quail. The Lubbock Lake Landmark contains evidence of almost 12,000 years of occupation by the ancient peoples of the Southern High Plains, beginning as early as the Clovis Period. Remains were accidently discovered in 1936, and since then the museum has governed the preservation and research at the landmark. For thousands of years, Lubbock Lake was a watering hole that attracted animals and hunters. People of the Southern High Plains relied on the lake, springs and marshes for water and the abundant wildlife ecosystem that provided them with food, shelter, tools and clothing. After farm irrigation increased around Lubbock in the early 1930s, the lake went dry. In 1936, during dredging excavations that were initiated with the plan to reactivate the springs, a Folsom point was discovered by two young men. The artifact was identified by Dr. W. Curry Holden, first director of the West Texas Museum. Unfortunately, the original point went missing in the 1950s, and a reproduction on exhibit at Lubbock Lake. Folsom points are stone knapped projectile points that are extremely thin and show fluting on one or both sides. They are named after Folsom, New Mexico, where a sample was found within the remains of a bison in 1927. The Folsom points found at Lubbock Lake are made out of Alibates chert, chalcedony and obsidian. A wonderful display on flint knapping explains the materials and tools used from ancient times to today. There are 3-D prints of the Folsom projectile points that visitors are allowed to handle. Clovis points from the Paleo-Indian period (11,500 to 11,000 years ago), Plainview points and Lubbock points (10,000 years ago), and other stone points from as recent as 200 years ago were found at Lubbock Lake (An Ancient Watering Hole: The Lubbock Lake Landmark Story, Eileen Johnson & Patricia Martin, TTU Press, 1990). Another very informative display was the interactive exhibit “Reading the Rocks”, which showed the stone materials and tools found at Lubbock Lake. A great display titled “The Puzzle at the End of the Pleistocene” puts a question to the viewer: Why did over half of North America’s large animals and numerous species of small mammals and birds disappear in a span of a few hundred centuries about 11,000 years ago? The ongoing scientific debate is about whether the reason was a climate change at the end of Ice Age or hunting to extinction. Paintings and displays explain the change and size adaption of the early giant bison into a smaller species that has survived the drier climate until today. Other exhibits and dioramas explain the arrival of the Apaches and a new hunting tool—the bow and arrow—introduced around 200 and used until about 100 years ago. Other displays show the arrival of the Anglos, who hunted the buffalo herds and wild horses, and the later introduction of sheep herds and cattle. Lubbock Lake was called Long Lake by the hunters and cattle drovers, and in 1881 the first mercantile store opened there. In the studying room, where students can learn about the bison, mammoth and the early cultures, a small poster titled “America and the Buffalo” caught my eye. It showed the sad statistic that there were 60 million bison in 1492, and only 541 in 1889. They made a miraculous comeback in 1951, numbering 9,252 head. Today, there are more than 500,000 bison, but only 4% of them make up the wild herds at the national parks and private preserves. The rest are raised as livestock. 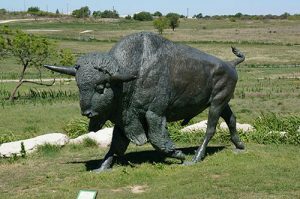 Large bronze sculptures of bison and other animals are placed around the Lubbock Lake Landmark. field, and copies of articles, such as one about Lubbock Lake Landmark being one the most intriguing archaeological sites in North America (“Land of Ages”, Kippra D. Hopper, Vistas, Summer 2003). The Lubbock Lake Landmark is a fascinating window to the past, a wonderful place to spend a couple of hours learning about the people and wildlife that lived in that area, their way of life, their tools and materials. I am so glad we added it to our museum itinerary! The Landmark is open every day except Monday. There is no entry charge here, but donations are encouraged.